If you’re tired of the standard white bread and yellow cheese hamburger combo, you should consider heading to Japan. 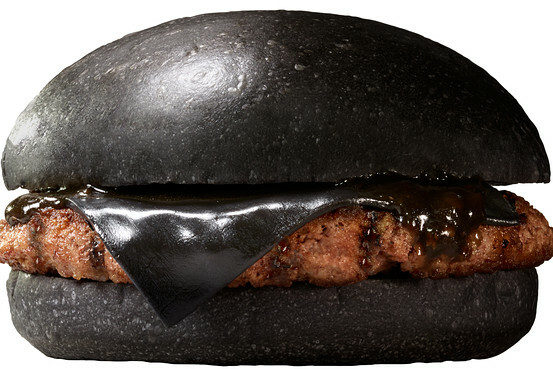 Building on the success of its Kuro burger — an all-black burger introduced for a limited time last year — Burger King Japan will unveil a new black burger that involves black cheese on September 19. Kuro means black in Japanese, and thus the burger’s name gives a very clear indication of what you get when you order this new burger. If you go for the Kuro Pearl burger, you should expect to get a hamburger patty, black cheese, and black sauce, all served on a black bun. If you order the Kuro Diamond Burger, you’ll get the same combination, but with tomato, lettuce, and onions added on (note: these added vegetables all retain their original color, fortunately or unfortunately, depending on who you ask). Interestingly, the company doesn’t use the same ingredients to make the different parts of the burger black. Where the buns and cheese get their ebony hues from added bamboo charcoal, the darker sauce comes from adding squid ink to the classic recipe. According to a spokeswoman for Burger King Japan, it’s not all about the looks, either — apparently the bamboo charcoal gives the bun a nice aroma as well. If they look unappealing to you, you’re in the minority. The same spokeswoman told The Wall Street Journal that the black burgers have repeatedly sold well in their limited-time-offer trial windows. She explained that “the black burgers sold extremely well because of their visual impact, but people continued to come back for them because of their taste.” Go figure! How much do these black burgers cost? The Kuro Pearl burger will set you back 480 yen, or approximately $4.50, while the add-ons of the Kuro Diamond burger will cost you almost an extra $2.00, coming out to 690 yen, or $6.45. Between the black burger and Pizza Hut Japan unveiling its "Pizza Cat" campaign last month, one thing has become clear: Japan likes to take its fast food chains to new, strange levels. But, hey, if videos of cats and Halloween-colored burgers are what make people want to buy your food, why not? If you’re dying to try one of the black burgers, you should book your plane ticket now — the two new black burgers will only be available until early November.